If you have never driven a Mustang, make sure you take one for a spin the next time you visit Peoria Ford! Even if you are shopping for another Ford car or truck, you should experience the legendary performance and inspired design of the iconic Mustang at least once in your life, and you can do just that at our Phoenix area Ford dealership. Scroll down for information about the 2013 Mustang's powertrain specs, cabin features, MPG info, available colors and other highlights. Also check out the video tour below to take a peek inside of the Mustang and a 360 degree tour of its exterior. Peoria Ford is proud to provide a comprehensive selection of 2013 Ford model reviews, vehicle comparisons, video tours and other user-friendly research tools to shoppers. We hope to help you find the perfect car for your needs, and vehicle research is a big part of the process. Scroll down to learn more about an iconic roadster, and find out why many sports car shoppers choose the Ford Mustang in Phoenix, Avondale, Litchfield Park, Glendale and other surrounding cities. When comparing the 2013 Ford Mustang to the 2013 Nissan 370Z, Dodge Challenger, Chevrolet Camaro and the Hyundai Genesis, and you'll notice that the Mustang out does those autos in many aspects. Browse just a few of the reasons below. Peoria Ford auto repair and service in Phoenix is just a click away! Your Ford deserves to be treated with the utmost respect - that means Mustang factory- trained Ford technicians, the comfort that comes from a 12-month service work warranty and real Ford parts and accessories. Your Mustang will run efficiently with backing from the aces at our Phoenix service center. Whether you come for standard oil changes, a simplistic front and rear brake pad fixes or anything else, we'll complete your Ford repairs with without breaking a sweat. For quality Ford repair in Phoenix, drive your Mustang to Peoria Ford, where you can plan on getting customized service. Click the next link to find terrific service specials now! Visit Peoria Ford - your leading Phoenix area Ford Mustang dealer today! In Consumer Guide's 2013 Ford Mustang review, the publication states: "Any Mustang is a fine sporty coupe that offers an attractive blend of performance, swagger, value, and surprising usability." Along with receiving praise from Consumer Guide, the 2013 Mustang has also received accolades from several esteemed automotive publications and websites, including Edmunds.com, U.S. News & World Report, Kelley Blue Book's KBB.com and many others. In the affordable convertible and affordable sports car segments, the Mustang's main rivals are the Scion FR-S and Mazda MX-5 Miata. Unlike these and many other competitors, the Mustang offers a unique blend of power and practicality. Its acceleration and horsepower ratings exceed those of any similarly equipped FR-S or MX-5 Miata. Yet, with all the power that it's got under the hood, the Mustang also makes a terrific daily driver thanks to its impressive fuel economy, as well as its interior volume and cargo space, which also beat out what the FR-S and Miata offer. In KBB.com's Ford Mustang review, the publication actually gives it a perfect 4 out of 4 ranking for MPG. So what are you waiting for? 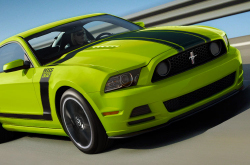 You have several reasons to come try out the Ford Mustang at our Phoenix area dealership! When you come for your test drive, also remember to ask about current Ford incentives and dealership discounts that you may qualify for.